At WWIL, Information Technology (IT) is the backbone of virtually every process, from wind energy research to manufacturing, project implementation and long term after sales service. IT also facilitates business intelligence and an advanced management dashboard with web and mobile interfaces for employees, vendors and customers in the form of portal applications. These applications are tightly integrated with SAP ERP, SCADA and other legacy systems. In fact, business is unimaginable without support from the IT backbone currently in place. 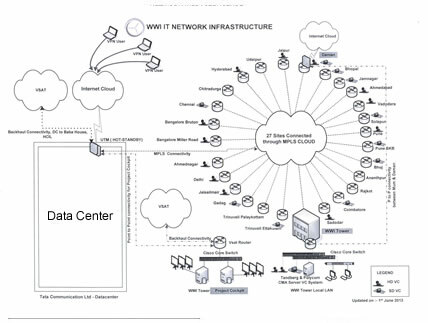 All manufacturing plants, regional and business development offices, project and service sites, are connected with V-SATs/MPLS/VPNs for online access of IT applications, hosted at the Mumbai data center. IT applications can be accessed even on the go, using smartphones and other mobile platforms. Our IT solutions team has created a robust and secured communication infrastructure with stable high quality HD video conferencing facilities, at all key locations in a board room environment. These are integrated with a client-based VC facility for users to integrate business activity planning, and day-to-day reviews and monitoring of business performance. A robust IT infrastructure has been created by connecting all the wind turbines for online performance monitoring and control of turbines centrally on a 24 x 7 basis, by streaming WEC SCADA data through software. The objective is to ensure high availability of turbines and optimization of power generation. WWIL uses Business Intelligence and dashboard applications for corrective action and continuous improvement of service to our customers and their return on investment, using WEC performance data from the SCADA application. All business process of manufacturing, projects, services, etc., are automated through SAP. Complex business processes like LC with BOE, BG, etc., are also automated through SAP with seamless interfaces to digital workflows, document management, email and smart phone applications with automated alert systems. Customers are allowed to access their daily generation data through our wCare - Customer portal. Vendors are provided with an wKraya - Supplier portal for registration and other features of their interest. This application has aptly been named 'Business at the speed of thought'. The application facilitates the posting of day-to-day business transactions in SAP, from over 200 mobile devices. 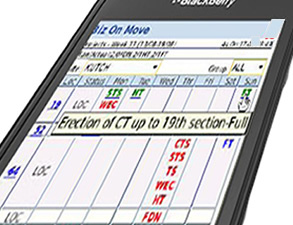 This covers posting SAP project activity confirmation, SAP project remote site issue management, approval workflows with daily SMS alerts and updates on project progress, email alerts and online MIS of project and production progress status, on Blackberry and smartphone devices. In keeping with the WWIL training philosophy, regular trainings and workshops are imparted to technical developers as well as end users, for effective utilization of all our IT applications. As we set our minds on the future, our eyes and hands are at work, since we have been mandated to incorporate the latest hardware, software and applications into the mainstream of our business practices. Thereby, adding velocity to WWIs journey to the future.